Three thousand members of the University community gathered Monday (Jan. 23) to reflect on the life and legacy of Martin Luther King Jr. and what they mean for America today in the midst of national division. The second annual Martin Luther King Jr. Celebration Luncheon, sponsored by the Office of the President and the President’s Oversight Committee on Diversity and Inclusion, marked the start of the University’s “Walk the Walk Week” observance. The luncheon program featured remarks by President Rev. John I. Jenkins, C.S.C., and a conversation with U.S Court of Appeals Judge Ann Claire Williams, a Notre Dame alumna and trustee, with Luis Fraga, co-director of the Institute for Latino Studies and professor of political science, as convener. In his opening remarks, Fraga discussed King’s emphasis on the importance of conscience and what it means for our individual and national consciences today. Fraga noted that among the most significant ways that King enlightened, and in this way, empowered us, was through his call that we use our faith, our reasoning, and our actions to become people of conscience. Senior Sara Abdel-Rahim offered the invocation. A video featuring University students, faculty and staff responding to the questions, “What does Walk the Walk mean to you personally and as a community?” and “How do you Walk the Walk?” was then aired. In his remarks, Father Jenkins noted that King was not just the leader of a movement for political and social reform. Build a Notre Dame community in which all can flourish. Live in solidarity with all people, and particularly the most vulnerable. He also indicated that the attendees would find a card outlining these principles at their seats. The principles were first articulated by Father Jenkins during his address to faculty last fall. “Make no mistake: these commitments are not a nod to political correctness nor to some passing fashion. They are not imposed on us from the outside. They emerge, rather, from the very heart of Notre Dame’s mission and history. As our mission statement says, our “aim is to create a sense of human solidarity and concern for the common good that will bear fruit as leaning becomes service to justice. Our principles of diversity and inclusion are part of what define us as a Notre Dame community. We are ND only if we are guided by them." McGinley asked Williams to reflect on a series of King quotes, such as “If you can’t fly then run, if you can’t run then walk, if you can’t walk then crawl, but whatever you do you have to keep moving forward,” and “There comes a time when one must take a position that is neither safe nor politic nor popular, but he must take it because his conscience tells him it is right.” In response, Williams discussed her upbringing, Notre Dame Law School experiences and her judicial career. Williams described her upbringing in Detroit and the influence her parents played in her life. Although both of her parents held college degrees, jobs in their fields were not open to them at the time and her father worked as a bus driver and her mother as an aide in school for juvenile delinquents. 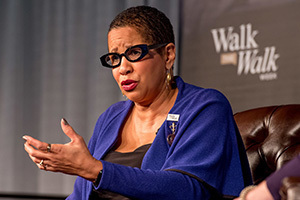 Williams also discussed her experiences as a federal judge and her service on behalf of the legal profession, including organizations such as the Just the Beginning Foundation, which encourages legal careers for African Americans and other underrepresented groups. The most important part of her job as a judge she noted is to provide equal justice. “Those vulnerable populations are the ones we have to worry about and I think that’s what Dr. King was saying: it’s not just that you’re safe and you can afford justice,” she said. Following her remarks, Williams, accompanied by the Voices of Faith Gospel Choir, sang the Elvis Presley song “I Believe,” inviting the audience to hold hands while joining her on a final verse. The celebration closed with a benediction by senior JesusisLord Nwadiuko. For photos, videos, and remarks from Monday’s luncheon and for more information about Walk the Walk Week, please visit http://diversity.nd.edu/walk-the-walk/. Originally published by William G. Gilroy at news.nd.edu on January 25, 2017.